Alfa Romeo has never made an SUV. That statement wouldn't have raised eyebrows less than a decade ago, but the world's interest in SUVs and crossovers has increased to frenzy levels and every car maker is trying to come up with fresh new takes on the SUV idea to capitalise on demand. Alfa, meanwhile, has unveiled its first, the Stelvio, named after a famous piece of road in the Italian Alps. 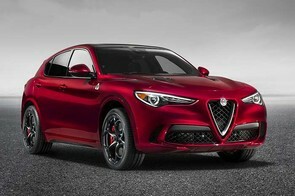 And, as you'd hope, the Stelvio looks just like an Alfa Romeo, but super-sized. It shares a lot with the new Alfa Romeo Giulia saloon that is just now hitting the Irish market, including smooth diesel engines. Expect to see it in Irish showrooms at the very end of the year. A lot has already been said about the seventh-generation BMW 5 Series, which replaces the company's best-selling iteration of the business saloon. The new car is lighter, more luxurious, more high-tech and more comfortable than ever, while, according to BMW, being better than ever to drive. Irish BMW dealers will gladly take your orders right now, though first customer deliveries are unlikely to be before March. It's worth waiting for, believe us. As before, the majority of sales will be made up of the efficient 520d model, and it's worth considering xDrive four-wheel drive too. The Civic, now about to head into its tenth iteration, is undoubtedly Honda's most important car. The new one, arriving ahead of the '172' plate in July, retains the five-door hatchback design of the current model, but it looks decidedly different, eschewing a high-tech, but kind of odd shape, for a more universally appealing and more elegant fastback profile. The interior promises to be as spacious and high-quality as ever and, complementing the efficient 1.6-litre diesel engine will be two new small turbocharged petrol options that better suit low-mileage drivers. The previous Jeep Compass was a completely forgettable compact SUV that barely deserved to wear the hallowed Jeep badge and grille, but there are big plans afoot for the brand new car, arriving in Ireland this year and tasked with taking on the biggest selling crossovers in the market. Yes, that means the new Compass will be pitched at the likes of the Hyundai Tucson and Nissan Qashqai. Sounds optimistic, but the signs are good for a Jeep come back, given some of the excellent new product the Fiat Chrysler Group have been launching of late. Now Jeep just needs to remind everyone what it's all about. Volkswagen's Tiguan needs no introduction, though the new one, launched earlier this year, has taken a big step away from the mass market towards the premium one, with its sportier appearance and high quality cabin - and a price to match. Nonetheless, it's an exceptionally good car. The Allspace version adds 110mm to the length to accommodate an extra pair of seats, making this the only seven-seat SUV in the Volkswagen line-up. About time some may say, but family buyers will be rubbing their hands with glee at the prospect.